Many students have asked about the big Rim Fire. What is causing it? How big is it? 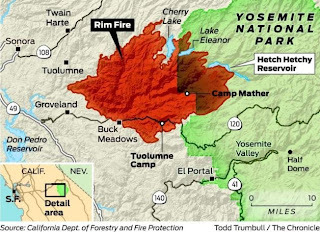 Here is some information about the big Rim Fire and about fire in California. 1. 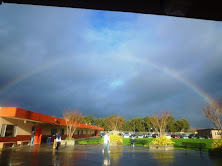 California has a Wet Season and a Dry Season. We have fires in the Dry Season. Sometimes we call this "Fire Season." Usually it starts in July. The really big fires are often in September or October. There was a very big fire in Oakland in October 1991. 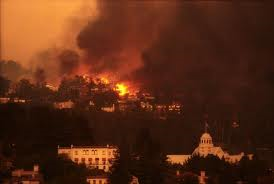 There was another very big fire in the San Diego area in 2007. 2. California has always had fires in the Dry Season. 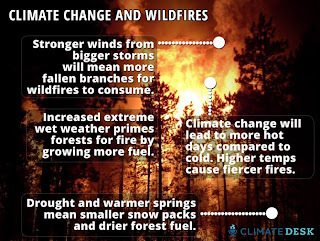 Fires are part of the natural cycle in California and the West. Some trees need fire to release their seed. Fires are normal. But things are different now. More people live in California now. Even if fire is "normal," they don't want a fire where they live. 3. The fires in California are getting worse. There are several reasons for this. One big reason is Climate Change - Global Warming. In fact, in just the past 10 years, California has seen three of the largest fire years on record. Now a new report by the state points to cause: climate change. 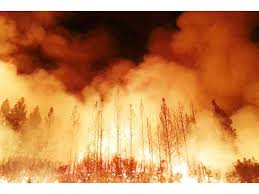 "The wildfires are getting worse, despite our ability to fight them better," said George Alexeeff, director of California's Office of Environmental Health Hazard Assessment, on Take Two. "The connections with climate change have to do a lot with moisture content…The snow is melting sooner, and the summers are getting warmer so the fire season is starting earlier, and lasting longer due to the lack of moisture content." That means everything is getting drier - so there are more fires, bigger fires, and the Dry Season is longer so... more fires! In addition, the report says that coastal waters off California are getting more acidic, fall-run chinook salmon populations to the Sacramento River are on the decline and conifer forests on the lower slopes of the Sierra Nevada have moved to higher elevations over the past half century. That means because the weather is changing, plants are changing the location of where they grow. This is changing many things. Farmers have to change what they grow. And wild plants - trees and bushes - are changing where they grow, too. "The other contributor would be increase in infestation of insects such as beetles that weaken the trees," said Alexeeff. "An increase in temperature seems to increase infestations." 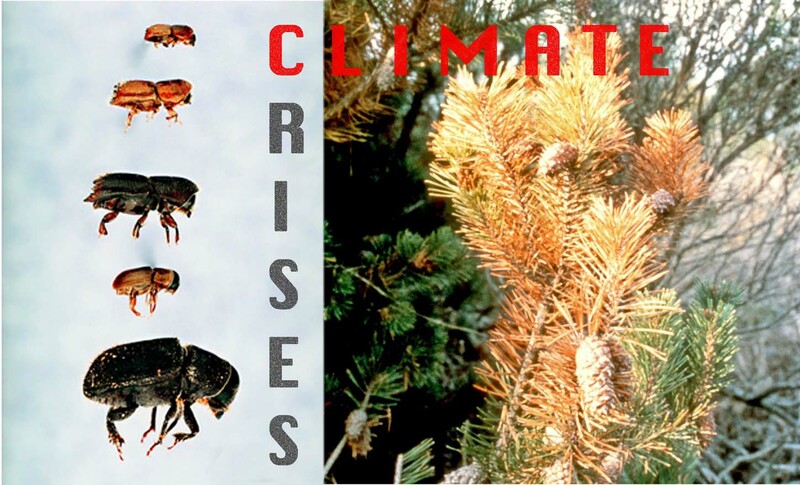 That means that the change in climate is making insects change where they live, too. 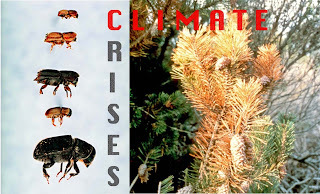 Some beetles are moving into new forests. The beetles make the trees sick. These sick or dead trees become fuel for fires. 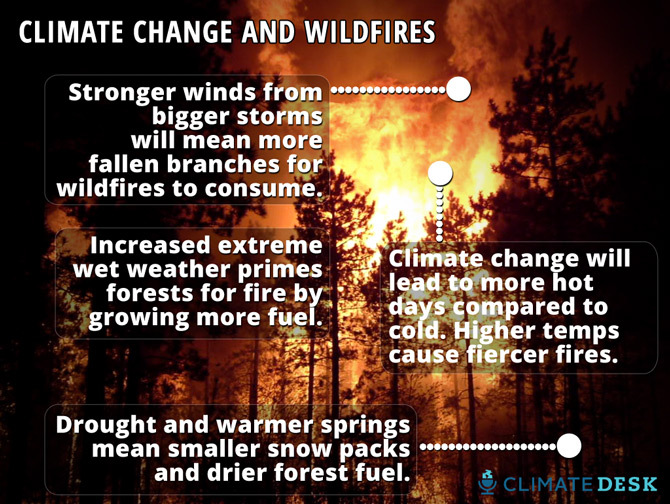 Climate change brings many problems that lead to more fires. 4. How about the Rim Fire? Where is it? What is it? How big is it? The Rim Fire is a very big fire burning in and around Yosemite National Park. 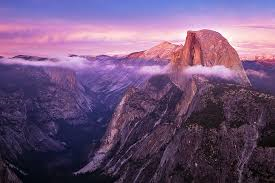 Yosemite is a famous park that many people visit. Yosemite is also where we get our water from. The water in San Mateo and San Francisco comes from the Tuolomne River. The water is stored in the Hetch Hetchy Reservoir. The giant wildfire burning in and around Yosemite National Park struck the shores of the Hetch Hetchy Reservoir Tuesday, threatening the famously pure mountain water that feeds the taps of 2.6 million Bay Area residents. That means the fire has reached Hetchy Hetchy - where we keep our water. San Francisco water managers, who operate the reservoir, reported that water quality had not been compromised. Fears that falling ash could pollute the supply have been addressed - at least for now - by diverting unsullied water from the 8-mile-long Hetch Hetchy to smaller back-up reservoirs in the Bay Area, should it be needed. The water people say, "Don't worry. Right now the water is okay." Moreover, water is drawn from 260 feet below the surface to avoid unwanted debris. They get the water from the bottom of the reservoir so it doesn't have ash in it. But wildfire experts say problems for San Francisco's water agency may come later. Hetch Hetchy's pristine waters will be vulnerable to eroding hillsides as the fire leaves behind torched soil that can't absorb autumn rains and leveled forests that no longer anchor steep mountain slopes. "Landslides are absolutely a concern," said Keith Gilless, dean of the College of Natural Resources at UC Berkeley. "Trees promote stability, and if you lose the trees you may get mass movement of the soil. And if the fire is a really hot one and it scorches the soil surface, the soil becomes less penetrable." After the Dry Season comes the Wet Season. Sometimes the raims are big and hard and fast. Then the dirt becomes mud. The mud can move fast. We call this a landslide. A lot of mud and dirt can move and destroy many things - houses, trees, etc. All this adds up to more sediment flowing into the water, Gilless said, which not only degrades quality but can pile up in a reservoir and decrease its capacity. Mud can be a problem. It piles up in the reservoir and it makes the water dirty. The Rim Fire, which began Aug. 17 in a remote section of the Stanislaus National Forest, has since burned into the western edges of Yosemite, where the 117-billion gallon Hetchy Hetchy reservoir has held drinking water for the Bay Area since the valley was dammed in 1923. 5. How do we stop these big fires? What does contain a fire mean? Firefighters can't put out a very big wildfire. The fire is too big. There is too much fuel - too much wood, too many trees to burn. What does put out a fire mean? 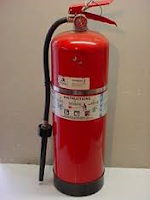 If you have a small fire in your house, you can put it out with a fire extinguisher or baking soda or water. With a big fire, you must let the fire burn itself out - run out of fuel. No more wood - so no more fire. But what if the forest is very, very big? What do you do? Do you wait for the whole forest to burn? You must contain it. You must dig trenches or cut down trees so there is nothing to burn. Then the fire must stop. But it's not easy to do this. When there is a lot of wind, the fire can jump from tree to tree. These big fires cost a lot of money to contain and put out. Officials said the cost of the firefight had swelled to $27 million. The fire is not out yet. It is about 20% contained. So we know it will cost more money. Gov. Brown said Adult Education can have $500 million in 2015. That is money for Adult Education for the whole state of California. The cost of this fire might be $50 million - or more. The cost of the fire will maybe be 1/10th the budget for Adult Education for the whole state. One fire. That is a lot of money. And it is making damage - all the problems with the water reservoir - that will cost more money. 7. Who contains and puts out these fires? 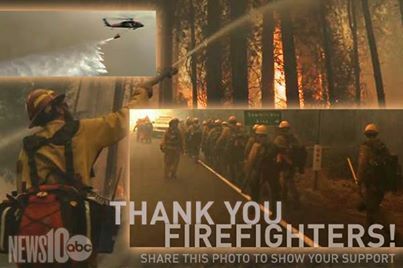 More than 4,000 firefighters from around the country are working to contain and put out the Rim Fire. They work very hard, under very difficult conditions. Sometimes firefighters die of suffer injuries in these big fires. 61 firefighters were injured in the San Diego fires in 2007. 8. What can we do about these big fires? * Be very careful when you visit forests, especially in the Dry Season. Be very careful with campfires, cigarettes, and anything that can make a fire. * Learn more about Climate Change and Global Warming. Get educated. Get involved. * Learn more about water. In California, we have a secret: Our real treasure is not gold. Our real treasure is water. We are the number one state for agriculture. But we don't have water everywhere like some states. Many parts of California are very dry. We move water around for people and plants, farms and fish. And we have big, Big, BIG arguments about that water. It costs money to keep the water in the reservoir. It cost money to move the water. It costs money to buy the water. And sometimes it makes money, too. Some places can sell water to other places. If the water is on your land, you have the "rights" to the water. We argue about water rights. Climate Change is changing the water situation in California. There will be more arguments. We need to learn more about water and make good plans for the future.